I am a Blizzard fan boy. There I’ve said it. I’ve tried almost (if not all) of Blizzard’s games at some point or another. I admire Blizzard as a game company. Back in the day they stood right next to Westwood and Bullfrog as my 3 most favourite game companies. Now the latter two are dead. Somehow Blizzard has stayed and grown, and grown, into the great powerhouse it is now. Thankfully it seems it is here to stay. With Overwatch and an actual movie looming up on the horizon, I’d say (and hope) that things are looking good for Blizzard for the next decade or so. 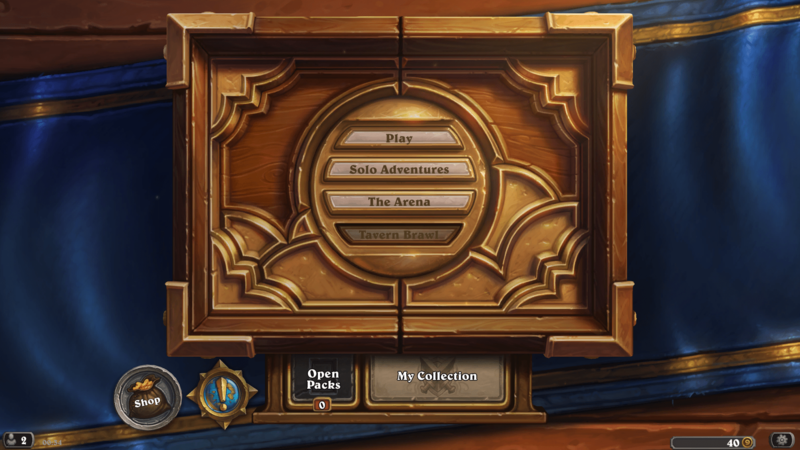 Now back to why I actually bothered to write a post at 11.44 pm on a work-day: Hearthstone. I started to play Hearthstone very recently because a friend of mine suggested that I give it another go. I had attempted it a number of times but I never really got into fully. Until now. I decided to start playing some of its adventures and got a “couple” of Old Gods Expansion card packs. I ended up hooked. I am now doing dailies almost … well… daily. If it were not for the occasional Overwatch game that’s all I would be playing at the moment. *my Steam library is looking at me like a jealous ex-girlfriend*. Anyway, I love this game. It gives you some amazing highs. The exhilarating feeling of a card drawn and played at the right moment is a feeling I never knew existed. Especially when said card wins you the game. Moreso, when the opponent has been battering you to bits all game. Old Gods capitalizes on this by means of the C’Thun card. I think Blizzard designers are really good at what they do and I love the fact that they get to try new mechanics through Hearthstone. I am quite sure that they are collecting analytics with the aim of understanding what makes people play and pay more. For all of you who never played this game: I am royally done (for lack of a better term I wish I could use but have not for the sake of decency). In the next turn my opponent can do a total of (12+10+5+3+5+5+5) 45 damage. I have 23 health which means that with just the first 3 minions attacking me in the next turn I have already lost. That is not counting any spells my opponent might have available (doubtful given the deck I guess, but possible nonetheless). This is a low, a terrible low, because I was playing the game confidently with quite an initial lead. Now I know that this guy was probably very lucky but damn does this feel like the game is punishing me for not spending more money to find more legendaries! If you don’t know how that part of Hearthstone works: the minions on the board with the dragon-like outline are legendary ones. They are extremely rare to come by and can be found either by buying a ton of card packs or by crafting (which also requires you to have a number of extra cards). Bottom-line, getting those cards is expensive and requires either a ton of time and dedication playing dailies or throwing a ton of money at the game. I personally maintain that legendaries win the game and this is how Blizzard make money – they want you to find them or craft them since this means you have to spend money in the game. Since most of us cannot spend so much time playing the game they know we will eventually cough up the money and pay and this is what they bank upon. I have no numbers to prove this and this is just what my gut tells me so I might be completely wrong but to me it does add up somewhat.